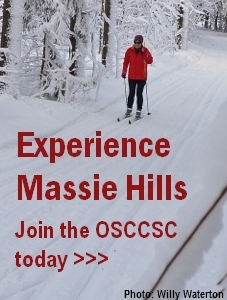 Just back from the Massie Hills trails and the spring skiing conditions are excellent. Lots of base left and well track set . Enjoy it while you can. The Massie Hills trails have been freshly groomed today and are in good shape. Decent base and just a few wet areas along the yellow loop. It is starting to warm up (-13 now) and the Massie Hills trails have been freshly groomed. Word from the Massie Hills trail is that it is great shape, freshly groomed this morning with 0.3 metres (1 foot) of fresh snow. There are a few spots that will be icy as they were wet and are now frozen. Bundle up and enjoy this nice sunshine. Our intrepid groomer has been out this morning and reports that there is about 1 inch of new snow over the hard pack and that conditions are skiable but icy and there is a section of the yellow trail that is impassable due to water on the trail. If you do go out we advise that you ski with caution. Personally, I am going to wait for more snow.